I mentioned in a previous post about the abundance of sample subscription services out there. 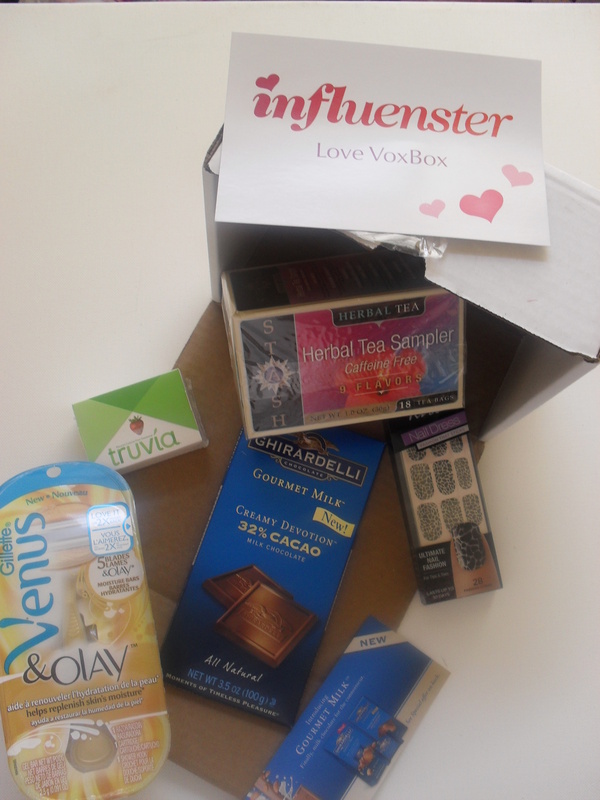 And one of the “boxes” I mentioned was the VoxBox– a program run by Influenster that connects qualifying members to the latest products and brands to hit the market, giving them a chance to try the products and post their own opinions about each individual product they receive in their VoxBox. I loved Influenster the second I heard about them, I feel like it’s a great way to give power back to the actual consumer. So I signed up, earned some badges, and now look at me! I’m doing my first post on my first ever VoxBox! So without further ado, I give you the Love VoxBox! 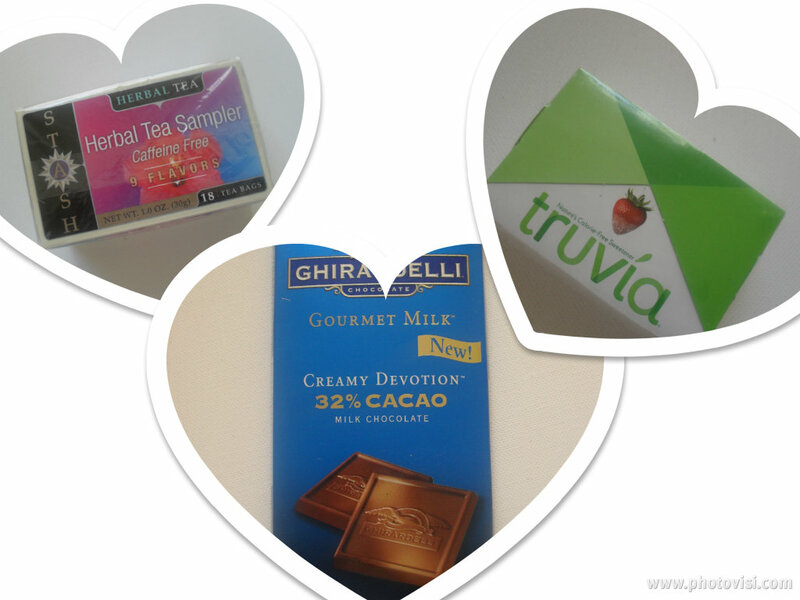 In this box I received one Gillette Venus & Olay Razor ($8.99-$10.99), one Kiss Nail Dress- Fashion That Sticks ($6.99), one Stash Tea Herbal Tea Sampler ($3.50), one Ghirardelli Gourmet Creamy Devotion Bar ($2.99), and one Truvia Natural Sweetener 40 ct. box ($3.99). Naturally Ghirardelli’s Creamy Devotion bar was amazing- it was so wonderfully creamy that I made up my mind to buy another the next time I’m in Rite Aid (or any other drugstore). I really love that I received the Stash Tea Herbal Sampler, and that it was caffeine free. I can’t really have too much caffeine so I was really happy that I can actually enjoy teas flavors like Acai Berry, Blueberry Superfruit, Chamomile, Lemon Ginger, Licorice Spice, Mango Passionfruit, Peppermint, and Wild Raspberry Hibiscus minus any caffination. As for the Truvia, it’s an amazing alternative to sugar and I highly recommend it for pretty much anyone, it doesn’t have any awful after-taste, and it great with coffee or fruit. There were two products in my box that I was extremely skeptical about, which was the Gillette Venus & Olay Razor and the Kiss Nail Dress- Fashion That Sticks nail polish adhesives. I always thought that the razors like the Gillette Venus were simply just a really expensive razor. And then I tried the Gillette & Olay one. Now I cannot say enough about this razor, first of all, it smells amazing. Second of all, the bars of moisturizer located around the razor blades leave your skin smelling, feeling, and looking amazing after shaving. The great thing about this razor is that you don’t need to apply any shaving cream, and the pivoting head of the razor makes it surprisingly easy to get to all those hard to reach areas. So if you’re looking for a really good razor, or hair removal product definitely pick up one of these at your local drugstore (RiteAid, CVS, Walgreens, or Walmart)- it’ll really cut your work in half and leave amazing results behind! Actually works and looks amazing! Now I’ve seen these nail “stickers” around for a while in my local Rite Aid, but as of yet I had not purchased any because it seemed pretty ridiculous for anybody to stick a “nail polish” nail on their finger and actually expect it to stay and not look like a first grader playing pretend (I totally stuck stickers on my nails and pretended that I had “real” nails- like fourteen years ago!). So I was super reluctant to try the Kiss Nail Dress- Fashion That Sticks Nail Polish adhesives, especially since I received them in a metallic silver and black crackle style (called camisole) and I have never been too keen on the crackle look. You can imagine my surprise when I actually tried them on and found how easy and gorgeous my nails looked- even with the crackled finish! These are super duper easy to apply, and they leave your nails looking like they were done by a professional- you cannot even tell that they were stick-ons! All in all, I cannot tell you how thrilled I was to receive this box- I was able to discover new products like the Stash Tea, Venus Razors, and Kiss Nail Dress. Now I not only have new favorites, but I was able to try things that otherwise I would have definitely avoided (the razors, and the nail dress) and now I love them! Thanks influenster for this great opportunity! So if you’re looking for a really great quality razor, bar of chocolate, tea, sugar alternative, or nail product- the products featured in this post (that were in my box) are the way to go! Next Post Product Rave: Gillette Venus & Olay Razor! Great review!! I received my first Vox Box too! I wish my writing skills were as good as yours are! Thank you so much- that’s so sweet of you! Do you have a blog too?? ?